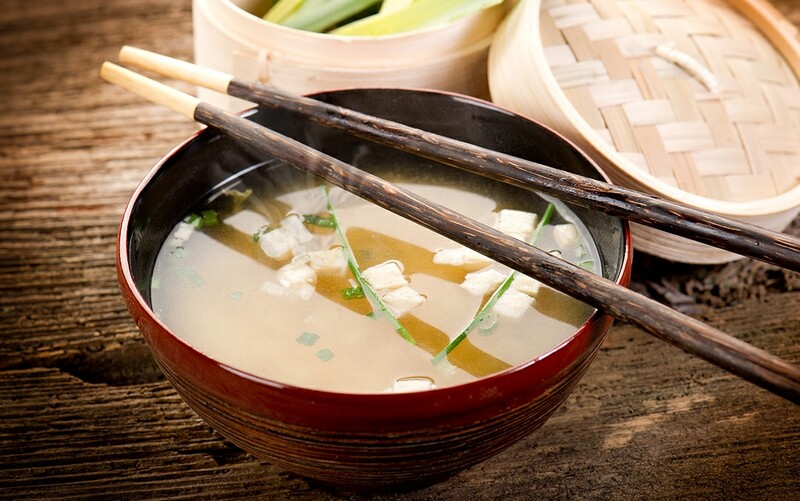 Ever wish you could get sushi-restaurant-fresh miso soup at home? The secret to authentic Japanese soup is in combining special ingredients to make umami, the mysterious “5th taste.” Here we share the miso soup recipe from Chef Miki Hashimoto of the outstanding new Japanese joint, Tokio, in Denver. In it, kelp (konbu) supplies glutamic acid, and dried bonito flakes (katsuo-bushi) provide inosinic acid, which combine to create the umami flavor. Most ingredients are available in major supermarkets—or try your local Asian market for top-quality selections. Choosing Miso: Miso comes in a handful of varieties, ranging from sweet and mellow white (hikari shiromiso) to stronger red (hikari akamiso). You can use one or the other, depending on flavor preference, or try half and half. *You may also use 10 g dried sardines if you like a more distinctive flavor. Heat the pot to a simmer and take kelp (and sardines) out before it starts to boil, at about 194°F or 90°C. Add dried shaved bonito and simmer for 3–4 minutes. Remove from heat, and strain the broth. Place strained liquid back in the pot. Add miso, dissolve. Keep the broth barely at a simmer. Never allow it to boil. Add tofu. Pour a little less than one cup of broth into a small soup bowl. Add thin-sliced green onion and a small amount of chopped spinach. Serve and enjoy!